Nobody disputes the challenge in getting more than 100 industries, some long gone, to underwrite a Portland harbor cleanup that could cost anywhere from $200 million to $1.7 billion over an unknown number of decades. That's why the Lower Willamette Group, comprising a handful of the waterfront companies with the City of Portland and Port of Portland, has worked closely with the U.S. Environmental Protection Agency since 2001 to forge a plan that balances economic capacity with a harbor restoration assuring ecologic and human health. But the collaboration fell apart this week. In a surprise action, EPA told the Lower Willamette Group that its human health assessment of harbor risks was out of line and officially declared LWG to be out of compliance with federal law. Fines of up to $5,000 a day were mentioned. A panicked grace period to talk things out was extended. Still, an angry LWG, which already has spent more than $70 million studying harbor pollution concentrations and remediation, countered that it would appeal the declaration to a higher authority within the federal agency. In its response to EPA, the Portland industry group wrote: "EPA's arbitrary and unexplained change of mind is unreasonable." 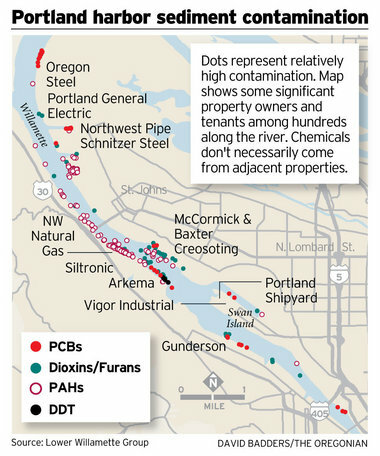 Portland Harbor Cleanup is Too Important to Get Hung Up on Fine Print <-- Full article available at original site.